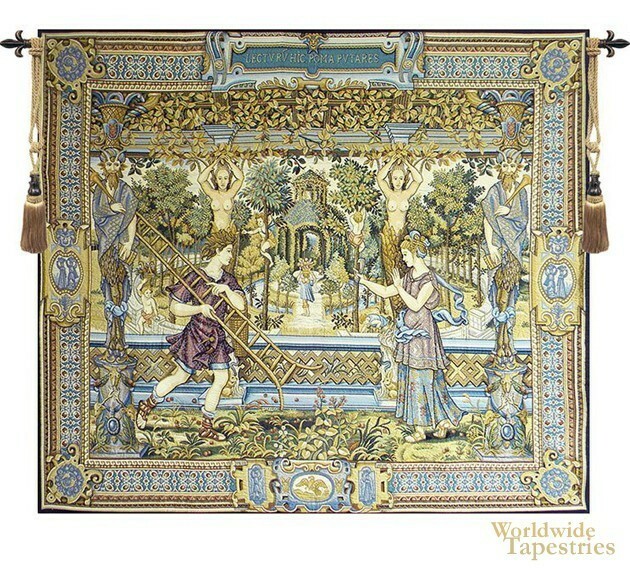 Part of a series of nine tapestries by Flemish artist Han Vermeyen (1550-1559), “Vertumnus” takes its theme from Ovid’s Metamorphoses. It features Vertumnus, god of the changing seasons, disguised as a gardener. He is in love with the goddess of fruits and vegetables, Pomona, and he tries many disguises to fool her. None of them work until he disguises himself as an old woman and tells a heart-wrenching tale of the tragic love affair between Iphis and Anaxarete. He then removes his disguise and the two embrace. This is the fifth in the series. It is exceptionally detailed, as you can see by the garden foliage and scene that’s filled with color and visual interest. The original can still be seen at the Calouste Gulbenkian Museum in Lisbon. This tapestry is lined and has a tunnel for easy hanging. Note: tapestry rod and tassels, where pictured, are purchased separately. Dimensions: W 57" x H 51"